Transgender Law Center's legal director Ilona Turner, who received the first Mary C. Dunlap Fellowship awarded at UC Berkeley Law School, recently spoke to the press when the Center obtained an historic federal ruling that transgender discrimination in the workplace is illegal. 2010 - 2011: "Claiming the Title: Gay Olympics on Trial"
In their award-winning documentary, Jonathan Joiner and Robert Martin tell how the Gay Olympics case, which Mary litigated all the way to the U.S. Supreme Court, pushed forward the fight for LGBTQ visiblity and equality in the 1980's. The film was broadcast throughout 2011 on PBS affiliates across the country. "Mary Would Do It" — oiled birds & Joseph Cornell. 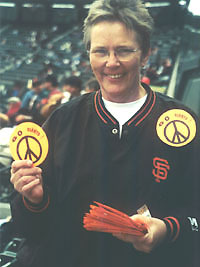 Mary is one of the activists profiled in "Feminists Who Changed America 1963-1975" (Ed. Barbara Love, Univ. of Illinois Press 2007). The Mary Dunlap Fellowship, Boalt Hall School of Law, is awarded for the summer of 2007. Mary's mementos are included in the "Laughing Bones/Weeping Hearts" Day of the Dead exhibit at the Oakland Museum, California. Two law students are funded by the Mary Dunlap Fellowship, Boalt Hall School of Law. 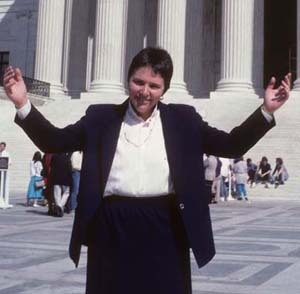 Lawrence v. Texas: Mary is surely beaming now! Many thanks to all the people who've been sending messages of support, donations, stories about Mary, and offers of such practical help during a terribly difficult time...and of course also to the friends who've continued to cook, help with the dogs, help with logistics, and patiently talk in the middle of the night with me, who really just are my response to the question, "How you holding up?" Anyone who'd like to contribute to the costs of the memorial can send a check to the "Mary Dunlap Memorial Fund" at [private address]. Many thanks! You may also want to read this week's beautiful celebration of Mary by Deb Price, whose syndicated column on gay people's lives appears in newspapers all around the country. The time and place of Mary's public memorial will be announced here shortly. Meanwhile, here is a copy of an obituary published last week by San Francisco's local legal paper, the Daily Journal, about Mary. The team who cared for Mary is slowing coming back to full strength, and people have been asking us how they can help. Fittingly an article about the oiled-bird rescue work done by Jay Holcomb, Mary's friend at this organization, appeared in the Chronicle the same day as Mary's obituary. We will be posting information here about memorial(s) for Mary as it becomes available. Thank you again for all your support.